This artsy, modern bookcase gets you organized with style. Our Barnes Bookcase is made of dark brown faux wood grain paper veneer over and engineered wood frame and features chromed steel side supports. Not only does this modern display shelf house books, but it is also the perfect place to show off your prized vases, décor and home accents. The Barnes Bookcase is Malaysian-made, requires assembly and should be dry dusted. 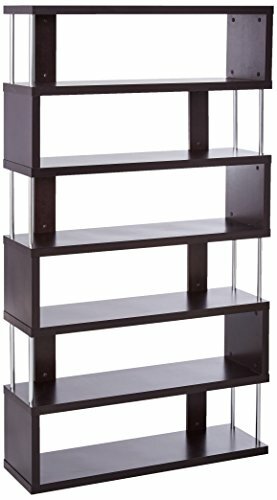 Separately offered is the Barnes Bookcase with three shelves. Dimensions: 75.2 Inch high x 43.3 Inch wide x 11.4 Inch deep. If you have any questions about this product by Baxton Studio, contact us by completing and submitting the form below. If you are looking for a specif part number, please include it with your message.